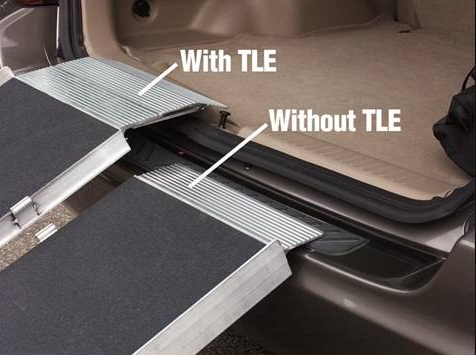 EZ-ACCESS TRIFOLD® Advantage Ramp, manufactured by Homecare Products, is designed to serve as a Wheelchair Ramp or Scooter Ramp . 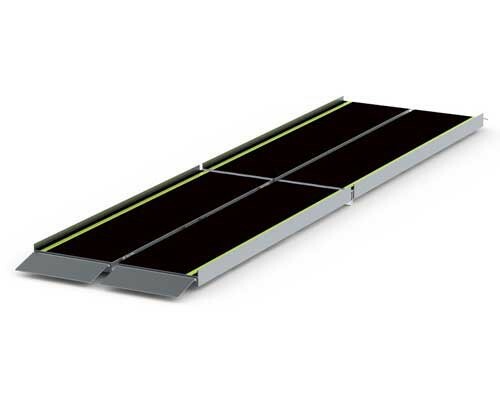 The EZ-ACCESS TRIFOLD® Advantage Series Portable Wheelchair Ramp, with its unique 3-fold design, offers the length required for wheelchairs and scooters to easily access steps, vehicles, and raised landings. 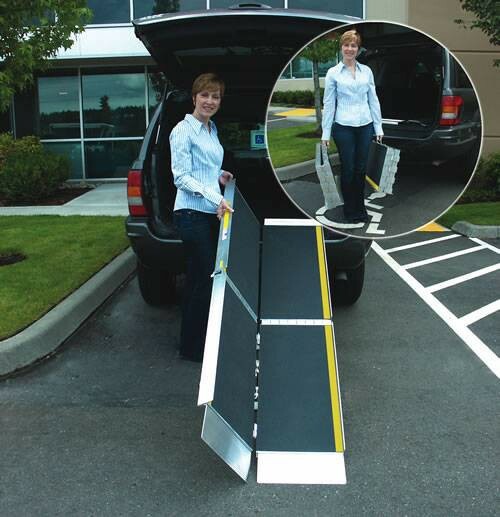 The EZ ACCESS Ramp is designed to be used and carried as a set, or if desired, can be quickly separated into two individual sections, making it even easier to use, carry, and store. By simply removing two hinge pins, the TRIFOLD Advantage Series ramp quickly separates into two lightweight halves, each with their own carrying handle. The durable, patent-pending hinge with interlocking brackets provides smoother operation and reduced pinch points. The portable EZ Access Ramp features high-quality skid-resistant tape with yellow safety strips and a self-adjusting bottom transition plate for easy conversion from ramp to ground. 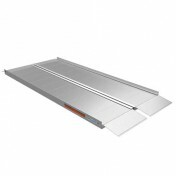 The EZ ACCESS TRIFOLD RAMP unfolds to a 29 wide platform. 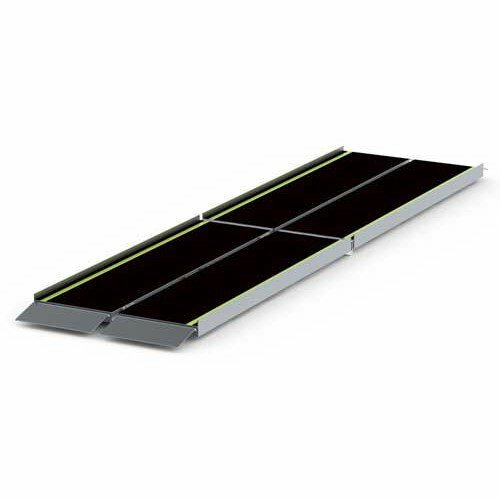 Manufactured of welded aircraft-grade aluminum, the EZ ACCESS Trifold Advantage Ramp features an 800 pound weight capacity and five-year limited warranty. Ramp designed for wheelchairs and scooters. Access steps, vehicles, and raised landings. Length Options: 5', 6', 7', 8' and 10'. 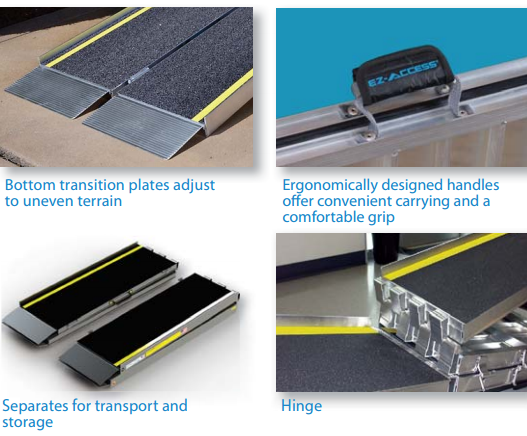 EZ ACCESS Trifold Advantage Ramp Warranty: 5 years. -Folded size: 30.75" x 15.5" x 9"
-Usage guidelines (consult your equipment's owner guide for proper degree of incline). Never exceed its recommendations. : Curbs, 1-2 steps, some minivans. -Usable size: 6' x 29" x 3.5"
-Folded size: 36.75" x 15.5" x 9"
-Usage guidelines (consult your equipment's owner guide for proper degree of incline). Never exceed its recommendations. : Curbs, 1-3 steps, minivans. -Usable size: 7' x 29" x 3.5"
-Folded size: 42.75 x 15.5" x 9"
-Usable size: 8' x 29" x 3.5"
-Folded size: 48.75 x 15.5" x 9"
-Usable size: 10' x 29" x 3.5"
-Folded size: 54.75" x 15.5" x 9"
-Usage guidelines (consult your equipment's owner guide for proper degree of incline). Never exceed its recommendations. : 2-4 steps, minivans, & full-size vans. 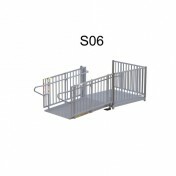 The ramp is available in 5, 6, 7, 8 and 10-foot options. This item is not available to rent through Vitality Medical. We were having mobility issues with mom who is now in a wheelchair. All of her children have stairs to navigate which limited her visits. This portable ramp was exactly what we needed, it's portable and small enough to transport from house to house.